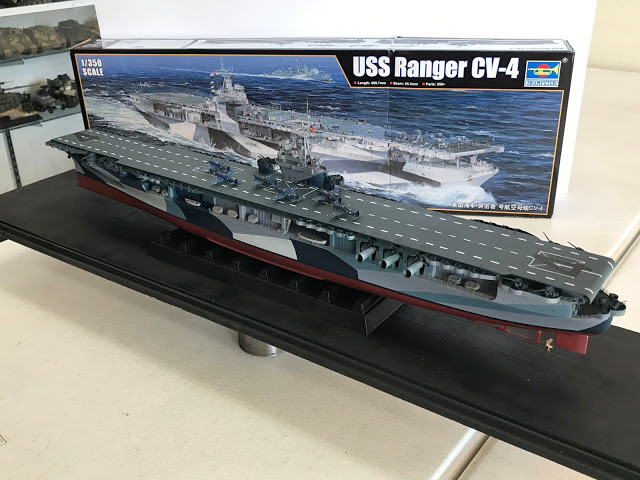 The USS Ranger shown below is a 1/350 scale model built and painted at Andy's Hobby Headquarters. Andy used Tru-Color Paint for the hull (the anti-fouling red and all the camouflage colors), the flight deck, propellers and the small aircraft. He also used our Tru-Color Paint Masking Paper for painting the camouflage pattern on the upper hull. Among the paints used were TCP-1000 Norfolk 65A Anti-fouling Red, TCP-1010 Deck Blue 20-B, TCP-1012 5-P Pale Gray, TCP-1013 5-L Light Gray, TCP-1007 5-N Navy Blue, TCP-1003 5-H Haze Gray, TCP-1014 Polished Bronze and TCP-1231 ANA-623 Glossy Deep Blue Black. All of these paints are available in 30 ml (1 oz.) and 60 ml (2 oz.) size bottles. We wish to thank Andy for using our paint products to paint this model. If you wish to obtain more information on our military and detailing paint product lines, just reply to this thread, call or write us for the current flyers on all. Thank you for your replies and we look forward to talking with modelers.